Wehrman earned the ProAm moto 1 holeshot, but Jace Johnson would make quick work to the front for the lead. After cancelling the first two rounds of this year’s season due to inclement weather, Quadcross Northwest bounced back at Horn Rapids in Richland, Washington to a great turnout and great weather. Several classes are stacked with talent and the new shirts for this year are looking prime as well. Saturday greeted racers with partially cloudy skies and cooler morning temperatures that moved into the mid-60s for the afternoon motos. Perfect racing weather, though a bit breezy. Saturday’s ProAm gate would hold 17 riders, including 3 from the Pro class. It would be the 02 of Jace Johnson that would make his way out front quickly and begin putting in solid laps with a gap ahead of Pros Rich Moore and Ruby Davis. Eventually Johnson faded and Pit Traffic rider Ruby Davis would take the lead and the win, followed by Rich Moore, Jace Johnson, Bryan Martin and Jesse Milbrath. “Well we invaded Lewiston, ID for the Fall Lewiston Supercross. The Quadcross Northwest racers from the Tri Cities(riders Josh Fain, Jeff Peters, Ryan Risdon, and Chris Ells) drove over to race with fellow Quadcross riders Garren Marlatt and Dan Pittron and Clinton Anderson. 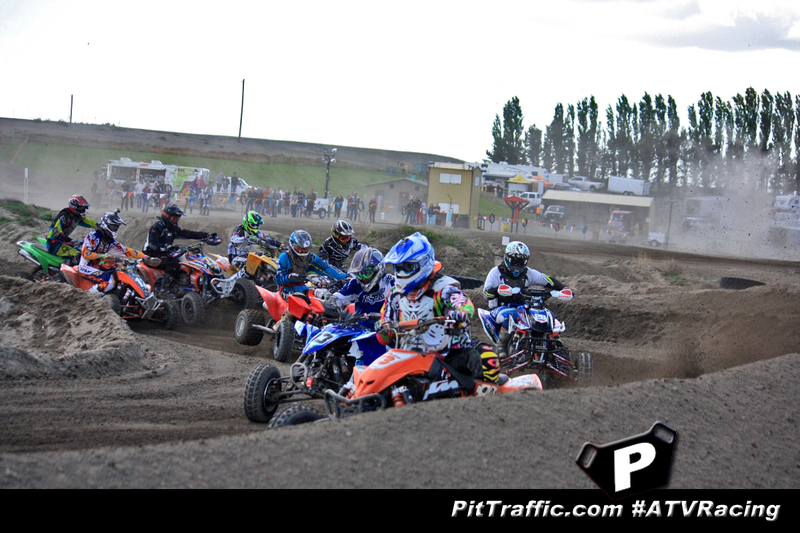 The Tri Cities guys dominated the quad race: Josh Fain Suzuki #360 1st ,Chris Ells Canam 2nd, Ryan Risdon Yamaha 3rd. 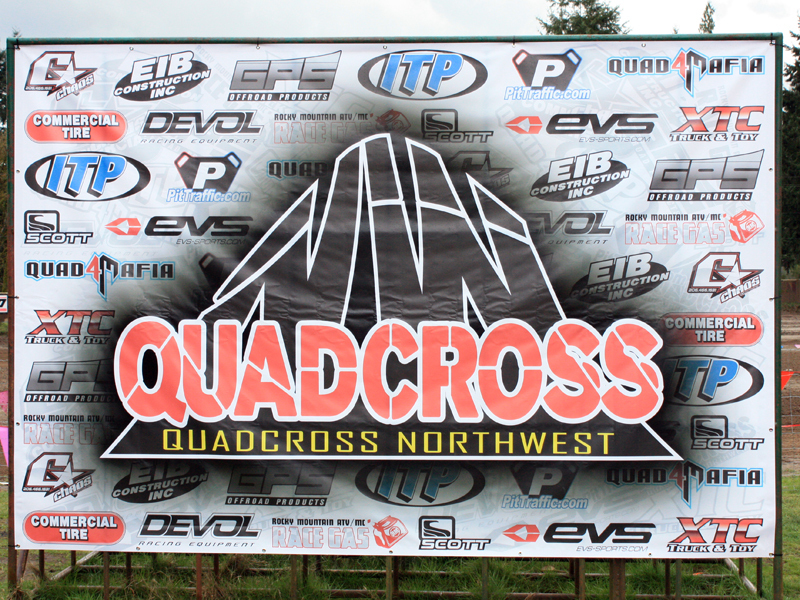 Thanks to the great companies (and more need to be added), riders, and families, the Quadcross NW series is a go! 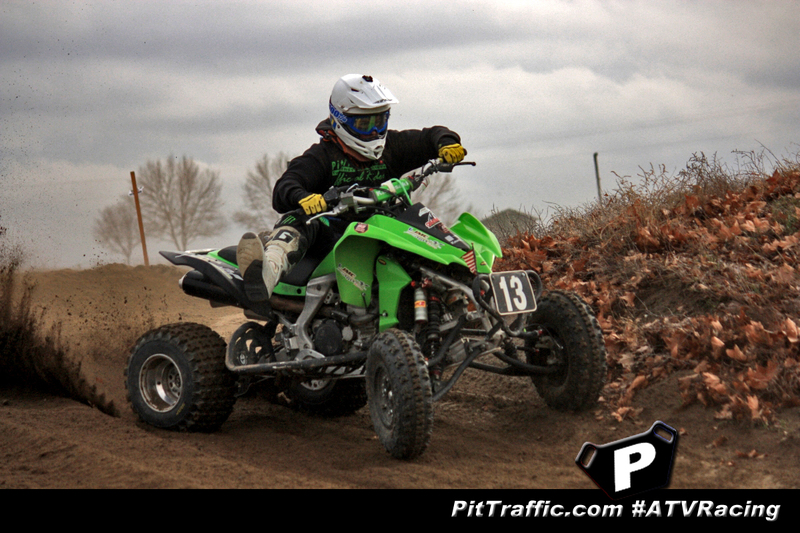 In typical Northwest fashion the spring weather was unpredictable but the turnout did not suffer at the opening round of the 2013 season of Quadcross Northwest. Riders braved rain, hail, gusts of wind and muddy conditions to start the season off this year right. After money fell through for the season, there was a last minute four-week scramble to kick the series off. After several companies came through with cash and families and riders donated what they could the series was announced as going forward. Riders from Oregon, Washington, California, Idaho and Canada came to race, and what racing there was! Saturday’s racing was a swampy mess and parts of the track were closed after eating several 450s. This shortened lap times to just over a minute for most classes, but riders were frustrated and it took one victim. PitTraffic.com rider Chris Frazier, who moved into the Production A class this year had a stellar first moto Saturday, taking the win over Colton Wehrman and Ben Hottel. Unfortunately Chris crashed in Moto 2 and broke his pelvis in 3 places resulting in an ambulance ride and a hospital stay. This left Wehrman open to take the win followed by Joshua Taylor and Ben Hottel. Riders gathered Saturday and Sunday for the 5th round of Quadcross Northwest at Straddleline ORV park. While Cody Irving was absent from the Pro class, opting instead to spectate the events and take some photos, a few new faces turned up as well as some familiar ones local riders have not seen in a while. Many riders commented on how much they enjoyed Straddleline’s improvements, some coming as far as California and Canada to participate in the event.